Don't you just love the magical world of Alice in Wonderland and her friends. I have recently sculpted and made a mould of a new doll for reproducing in the style of Alice in Wonderland. 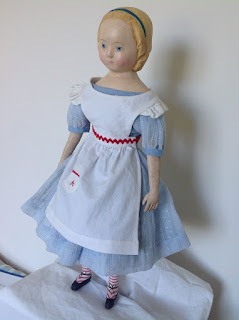 I have made her in the style of a mid 1800s doll. 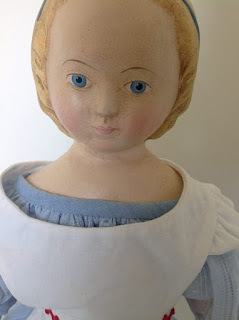 My dolls have an aged look just like they would have been found in the attic after many years of storage. The body, arms and legs are made from cotton fabric and stuffed with natural cotton fibre. The shoulder heads are made from a composition type material. I have carefully painted and aged them slightly. The clothing is made from cotton fabrics, mostly vintage for an authentic look. The following pictures are of my 2 Alice dolls that I am offering for sale. You can contact me if you have any questions or interested in buying them by using the email link on the right hand side of the page or purchase them directly from my online Etsy shop. 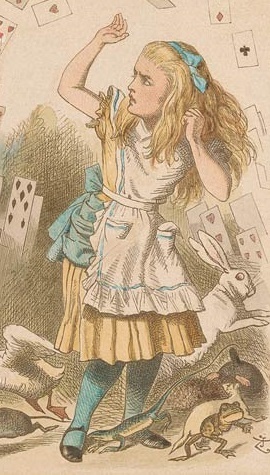 ALICE IN THE BLUE DRESS. The white cotton apron has red trim and embroidered "A"for Alice on the pocket. Painted headband with pretty painted bows for this girl. Painted and aged legs with shoes painted directly onto her feet but have velvet ribbon bows. Dress dyed and faded a pale yellow for aged look.